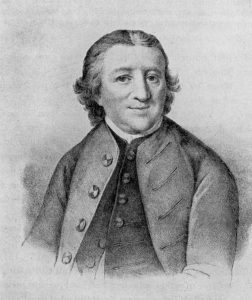 Peter (or Petrus) Böhler (1712-1775) was a German-English Moravian bishop and missionary. Böhler, as witnessed by George Whitefield in a letter to John Wesley, apparently confessed his beliefs in a universal redemption. Peter (or Petrus) Böhler (1712-1775) was a German Moravian bishop and missionary to England and America. Böhler took part in the first great Protestant missionary movement inaugurated by the Moravians. Having been ordained to priesthood by Nicolaus Zinzendorf in 1737, Böhler soon after traveled to London, where he met John Wesley. He later traveled to America where he served as a missionary in the colonies. Böhler became the superintendent of the Moravian Church in England in 1747. While Wesley was more in line with the Moravians in the belief in a general atonement, he, however, saw salvation as conditional upon the individuals free exercise of faith. Peter Böhler seems to have agreed with Wesley, though seemingly also being convinced that God would eventually be able to convince all to have faith, thus leading to the final salvation of all. This again shows how sorts of soteriological universalism should not be considered alien or heterodox to the great revivals in the 18th century. It should rather be considered one soteriological view among others. Böhler’s apparent views are arguably also an example that the belief in the final salvation of all need not diminish evangelical fervor and missionary zeal, as is sometimes claimed. Rather, it is exactly because Christ has died to save all, that the gospel must be proclaimed for all. 1See Robert F. Lay, Readings in Historical Theology: Primary Sources of the Christian Faith (Kregel Academic 2009), p. 339.